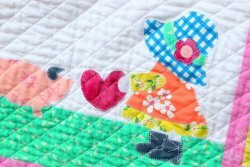 "Everybody needs a little love and Sunbonnet Sue is making sure this little pig is getting some special attention. The applique designs and quilt are made with Windham’s Daisy Chain fabric by Annabel Wrigley. 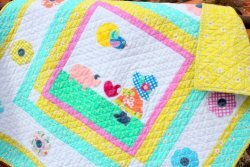 I love the bright colors and think it is perfect for any version of Sunbonnet Sue!" Please note, clicking the button below will take you to the article about the quilt. The pattern download is linked below the second quilt photo in the article, just click on the quilt name. On her Craftsy page, the pattern for this quilt is on page three of her free downloads.